AUGUSTA, Maine — To make his case for welfare reform and cuts to MaineCare, Gov. 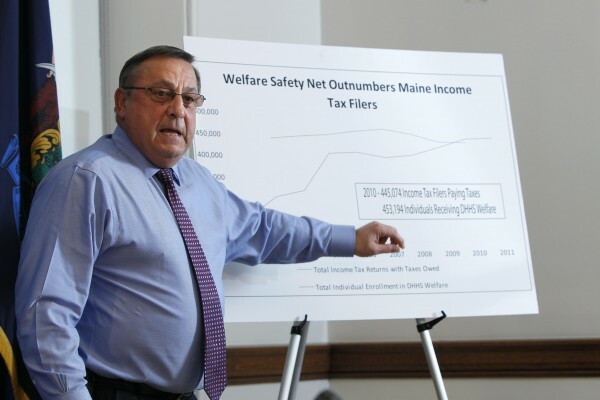 Paul LePage said recently that the state has more welfare recipients than income tax payers, a trend he wants to reverse. Democrats immediately criticized the data he used to make his case. Turns out, LePage was mostly right. According to Mike Allen at Maine Revenue Services, the number of Mainers who “paid” income taxes in 2010 was 445,074, as the governor said. However, the number of actual resident income tax returns was 584,076, including 246,785 joint filings. That means the total number of people who filed in 2010 was 707,469, a number some Democrats have used in response to LePage’s claim. Allen also said joint filings could include stay-at-home spouses who are not earning or being taxed on any income, so the 707,469 number is not entirely representative. Still, some Democrats dispute the numbers of taxpayers cited by LePage because income tax is not the only tax. Either way, the number of people paying income taxes will decrease by as much as 70,000 by 2012 because of a tax cut included in the budget. LePage defended those tax cuts even in the face of an estimated $220 million shortfall in the Department of Health and Human Services over the next year and a half. “Is it fair to take away tax cuts to those who need it most to pay for a government-run health care program that has increased its spending by $1 billion dollars over the last 10 years?” LePage asked in his address. The welfare recipient number of 453,194 used by the governor in his radio address is harder to explain, in large part because welfare is a broad term and the overlap of beneficiaries is almost impossible to quantify. To get to that number, LePage appeared to add the total number of Maine individuals receiving some type of public benefit outlined by the Department of Health and Human Services to the number of recipients of programs not included by DHHS, such as the MaineRx program. Asked what the governor included when totaling the number of welfare recipients, spokeswoman Adrienne Bennett provided a list of more than 50 specific programs or categories within MaineCare, the state’s Medicaid program. According to the state’s Office of Family Independence, a division of DHHS, 402,110 Mainers received some sort of benefit in November 2011, many of which are outside MaineCare. • 23,943 individuals received Temporary Assistance for Needy Families, a federal cash benefit geared specifically toward children. • 253,743 individuals benefited from the Supplemental Nutrition Assistance Program, also known as Food Stamps. • 9,343 individuals participated in the ASPIRE program, which offers subsidies for education. When he announced his proposal to change the eligibility requirements and eliminate some services through MaineCare to reduce expenses, Gov. LePage said 361,000 Mainers were receiving the health care benefit, or about a quarter of the population. His plan would eliminate 65,000 low-income residents from the MaineCare rolls. So if you add MaineCare, general assistance, TANF, ASPIRE and Food Stamps, the number is north of 660,000. That, of course, does not consider any duplicates. Bennett stressed on Monday that the number cited by the governor is unduplicated recipients. That means even if they received multiple benefits, they were counted only once. That claim appears to be supported by the DHHS data. Also not included in the DHHS numbers, Bennett pointed out, is the number of Maine residents who received general assistance, an emergency program offered through cities and towns. The state does not track general assistance cumulatively, so there is no way of knowing exactly how many cases there are. However, a recent U.S. Census survey indicated that 28,213 Maine households accepted public assistance in 2010, defined by the survey as either TANF or general assistance. Subtract the average number of households that received TANF in 2010 (14,013) and that leaves approximately 14,000 households that received general assistance. Some progressive groups have criticized the governor for using misleading statistics, particularly the welfare numbers, to support his agenda. She said the MaineRx program, for instance, costs the state nothing. All it does is provide non-Medicaid recipients with a card that allows them to buy prescriptions at the Medicaid rate. Bennett said the actual numbers are not as important as the bigger issue: The number of people paying taxes has stayed largely the same over the last decade while the number of people receiving welfare benefits has risen sharply.